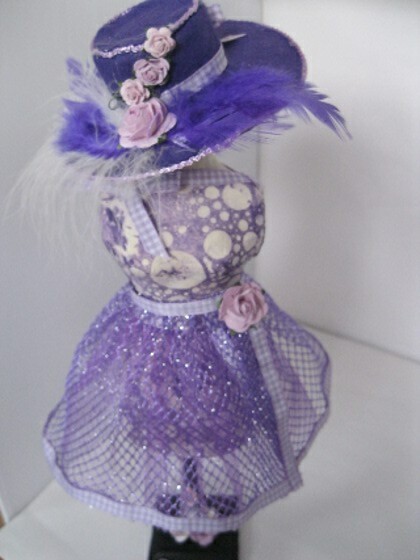 Dress Form Hat another style for you to add to your collection of pretty things to dress your own mannequin in . 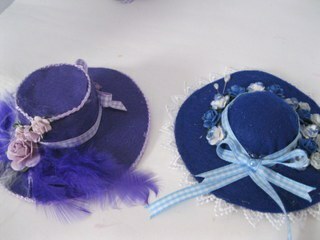 In the video Dress Form Hats I showed you how to create the hat with a domed crown like the one on the right. The video took you step by step through what you need to do to make that hat. But this one is a little different in it's style and yet the hat is just as stunning. The picture on the left shows you the height of the crown to the hat, and this can be as deep as you wish to make it... the video will show you how. You can see how the hat looks on the dress form here and the height that has been given to the crown. It makes for an unusual look very similar to the Victorian type of hats worn by the ladies of society in the last century. I have even added in some small hat pins. These two have been decorated in different ways to make them look very very luxurious... even though the felt fabric is the same. 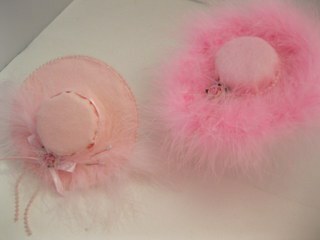 The one on the left has beaded trim and feathers with polka dot ribbon. The one on the right has Maribou Trim to match the Painted Dress Form. The fabric I have used for most of the hats has been felt as this is very easy to work with and gives a lovely finished effect. 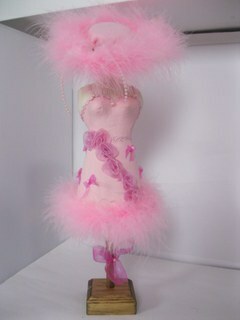 The stand was created by my "Film Crew" and I have added in the Hat pegs to all of the dress forms featured in these tutorials.